This book had so many wonderful things going that I don’t really know where to start. Montana was a great heroine. It must have been very hard for her to see her sisters succeed and know what they wanted while she was kind of drifting and trying new things to find her place in life, but instead of feeling sorry for herself, she picks herself up and throws herself into every new adventure to see if that was what she wanted to do for the rest of her life. She didn’t let her successful sisters overshadow her and she was never jealous. I think that lots of people can relate to her because sometimes figuring out who you are can be really hard. I loved to see how at home she felt with the dogs and what a loving person she was. She was the perfect match for Simon and the perfect companion for all the kids that are a very important part of the book. Simon was an intriguing and appealing hero. He had a personality that reminded me a bit of a person with Asperger Syndrome. He was very smart, painfully awkward with people, ambitious and confident in his ability as a doctor, he was brutally honest, he only had one friend and I had never seen a hero in such need of someone to love him. He goes around the world helping children but never staying in one place more than necessary. There’s a reason why he has so many scars, both physical and psychological, and it was one of the saddest and most painful stories I have read in a long time. I loved him because he was strong in some aspects but vulnerable in others. Mallery said in an interview that this was a Beauty and the Beast story where the hero was both beauty and beast, and that’s the best description you can get. Since the book’s hero is a reconstructive surgeon who specializes in burn children we spend a huge part of the book in the hospital. Because of that aspect this book could have been a crying-fest but Mallery managed to show us some very sad situations in a positive way, it wasn’t painful to read, it was actually uplifting. This story deals with some pretty dark subjects but it does it in a way that says that we can overcome adversity. Overall this was a wonderful book, it was funny, sad, touching and I can’t wait to read the next one. It stands alone well, but all the books in the series (not only this one but the original trilogy as well) are not only loosely connected but are wonderful reads as well, so maybe is best if you read them in order so you can get the whole Fool’s Gold experience. It seems like Mallery is setting up the books that will come after this trilogy is done, I’m guessing that Kent, the other Hendrix sibling, will get his own book, so I’m happy to see that once Nevada gets her HEA in the next book we won’t be saying goodbye to Fool’s Gold. Montana Hendrix has found her calling—working with therapy dogs. With a career she loves in a hometown she adores, she's finally ready to look for her own happily ever after. Could one of her dogs help her find Mr. Right… or maybe Dr. Right? HQN Books. August 30, 2011. Nice review; everyone I've read so far about Only Yours has been positive. Really enjoying Susan's Fools Gold Series. I loved this book, and I totally agree with the almost "cry-fest". There was one moment in particular that I was fighting back tears. I also love this series, although my favorite is the Buchanan’s series, have you read that one? Oh yes, I know what scene you mean but all was well at the end. Thanks for stopping by! 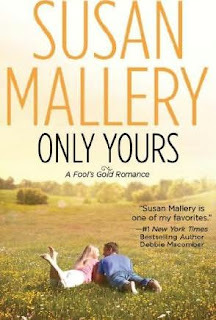 Love all of Susan Mallery's books but the Fool's Gold series has been my favorite! They are a definate "must read"
@Anonymous - I agree, the Fool's Gold series is also one of my favorites! Simon's dark moody side and Montana's heart of gold kept me hooked, but the dogs...I LOVED THOSE DOGS! 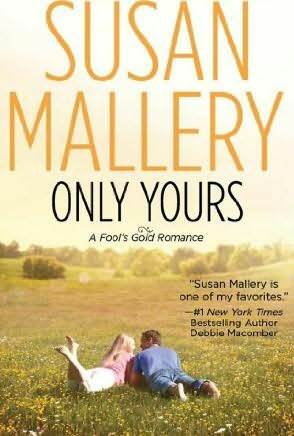 Only Yours is on my MUST re-read list! I loved Only Mine!! Montana's strength of character as she "finds herself", Dr. Simon's Beauty and the Beast, and oh, the DOGS! There's so much to love about this book, I had a hard time picking what I loved most. I laughed and I did have a little cry fest in there, too. Not too much, as it was soon uplifting, but there were some heartbreaking moments in this one. I found myself just wanting to hug Simon. Definitely a MUST READ!! @Anon: you’re right, I know I’m always saying this but this series is a must read for every romance fan out there. @Heidi: I loved how Montana’s cheerfulness balanced Simon’s moodiness, they were the perfect couple and I was so glad to see Simon get his HEA, he needed some serious loving! Thank you guys for stopping by and for your comments, I really hope to see you back! This book was the most touching, that’s for sure. I’m more of a cats person to be honest, but CeCe was so sweet, I just loved her. Love love love this story and this is a great review!! :) Susan Does it again with another great one! !